Frank Hutchins has fenced his cows out of the streams at his Cambridge farm, to keep manure from getting into waterways. Vermont’s small farms have always been subject to state clean water standards, but now the state’s near 7,000 small farms are facing a new reality: farm inspections. For the first time, small farms will have to certify with the state and undergo routine farm inspections to make sure they're doing everything they can to keep pollutants out of the water. For small dairy farmer Frank Hutchins, this means big changes — and big costs. Hutchins’ farm has about 70 milker cows, and he grows crops to feed them on a couple of hundred hilly acres on his farm. But the challenges are bigger than just keeping cows out of the water. Whenever it rains, water flushes through the barnyard and washes manure and grain leachate into the streams. Hutchins is working with the Natural Resources Conservation Service on several other projects to both contain manure, and reduce the rainwater flow. Hutchins is constructing a diversion that will send this nutrient-laden runoff from the grain bunker into a treatment area also being constructed. “We're also in the middle of a project to divert grain leaching from the bunker to a manure pit,” says Gabos. “If we get a big storm we're going to send most of the water to a treatment area” so nutrients don’t leach into the soil. These construction projects aren’t cheap. Hutchins is working with the USDA Natural Resources Conservation Service and the Vermont Agency of Agriculture to get financial assistance with these fixes. It’s a cost-share set-up, so Hutchins will still have to pay a percent of the nearly $150,000 price tag, and his labor will also count as part of his payment. Beginning the routine inspections of nearly 7,000 small farms across Vermont is no easy task. John Roberts is a farm inspector with the state Agency of Agriculture, which will be hiring some additional inspectors with funding from the Vermont Clean Water Act. “We’re talking 5,000 to 7,000 small farms. Part of that number is going to be defined is what is a small farm? I hope we're not going to chase after the person with one chicken who happens to be standing on a rock in the middle of the stream,” says Robert. “When I drive in the yard, and I've introduced myself to the farmer, probably the first thing is just a visual [inspection] and then the thing I'm looking for is: where this water flow, where are the obvious places water flows because it's water that carries the pollution,” says Roberts. Hutchins fixed up this cow path crossing a stream several years ago. By reshaping the path, lining it with gravel and vegetation, it filters any manure that might flow into the stream. Originally from England, Roberts made his way to Vermont some 40 years ago; and he used to farm 400 acres in Glens Falls, New York. He knows just how hard it is to make a living farming the land. Looking out at Hutchins’ acres on a recent sunny morning, Roberts points out the challenges of the hilly landscape crisscrossed with streams in the Seymour River watershed, which flows into the Lamoille River. Roberts says one thing farmers can expect is enforcement of a rule that's already been on the books but has been largely ignored to this point. “A lot of small farmers don't realize this, but under the present rules, the AAPs, they are required to soil test every five years. Unfortunately I think you’d find that very few farmers actually do that because it hasn't been enforced,” says Roberts. Now farmers will be held accountable for soil testing for nutrient levels. When small farmers certify with the state, they’re saying they’re obeying the new Required Agriculture Practices, which require them to soil test every field at least every three to five years. Farmers will also have to write a nutrient management plan, showing how they plan to spread manure and fertilizer, to make sure the levels aren’t excessive and leaching into waterways. Hutchins is investing in bringing his farm up to code even before the rules are written by next summer, and inspections begin in 2017. But even with help from the state and federal agencies for funding, it’s a lot of expensive changes for a small business in an industry often beleaguered by low prices. “It's a little bit overwhelming really,” says Hutchins. Hutchins knows farmers need to protect the waterways, but he says farmers often get unfairly blamed for all the problems. “I mean you look at the blacktop, the runoff, the ditches, the roofs,” says Hutchins. For Hutchins, how the new rules of Act 64, Vermont’s Clean Water Act, unfold could make the difference between continuing to farm the land and letting it go. He says it hasn’t been his goal to develop the land in another way, “but if you don't develop it, you gotta do something with it. Somebody’s gotta keep it going,” says Hutchins. Farm inspector John Roberts heartily agrees. Follow VPR News' reporting on water quality in Vermont in our ongoing series, Downstream. About 40 percent of the nutrients that run off into Lake Champlain come from farms. 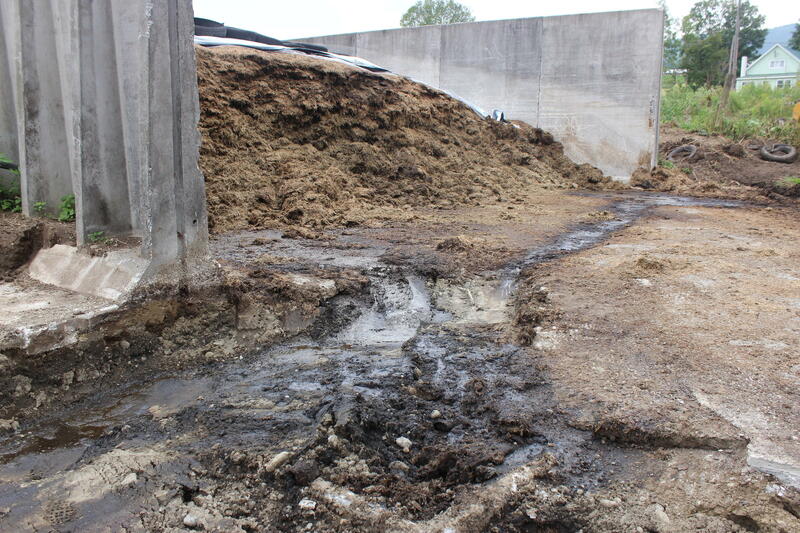 But surprisingly, about half that manure produced in the state actually comes from small farms. In the case of dairies, that’s defined as operations with fewer than 200 cows. The blue-green algae blooms invading Lake Champlain this summer can cause nasty stomach problems and skin irritation — and even liver damage in people who accidentally swallow the water. But researchers say there might be longer-term health consequences for people who come into contact with the blooms. The hot and humid dog days of summer are usually perfect swimming weather — but that’s not true in St. Albans Bay.